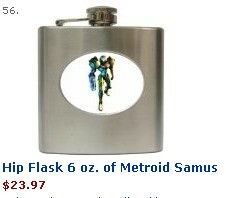 Yup, a Metroid thong. 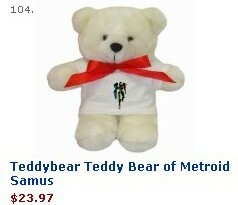 Click the picture for an Amazon link, too. Hoho! Sure is wacky. Given the way that Hot Topic and the like are whoring out 8-bit nostalgia to an audience that wasn't even really alive to appreciate it unironically, it wouldn't surprise me if these were somehow legitimate. 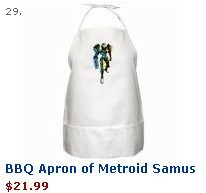 Looking at the piece, though, it clearly isn't, as it seems like the smart folk at Carson's Collectibles went wild on Cafepress and stuck the same picture of Samus on practically every piece imaginable. Here are some of the best! 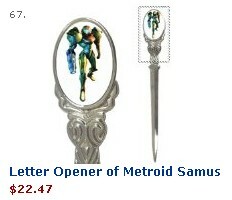 The best part of all of this was the extreme fervor Mr. Carson had in sticking Samus on stuff the intended audience would absolutely have no interest in. Does anyone under the age of sixty actually use letter openers? 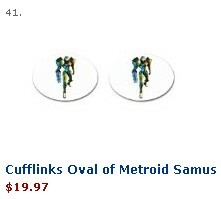 Who in their right mind would wear Metroid cufflinks? It's this sort of enthusiastic disregard for copyright infringement that sets this apart from the average Chinatown vendor. 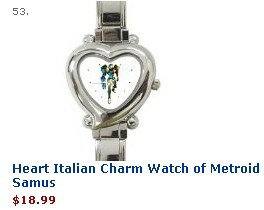 Cafepress automatically sticks your design on everything. 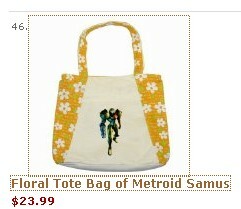 There is no surplus of Metroid thongs in a warehouse, everything is print-to-order. I called Nintendo and reported this guy, because his merchandise is REALLY shoddy and dodgy, and sellers like these are why Nintendo merchandise is so expensive.